Free eScanAV Anti-Virus Toolkit is a portable program to scan your computer to find any of threats that can harm your computer including viruses, malware, adware, keyloggers, etc. Free eScanAV Anti-Virus Toolkit besides performs operations like finding malicious software, spyware and other sniffers, it is also automatically updates its massive malware database so it is difficult to be infected by something that can not detect. 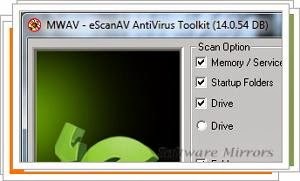 Free eScanAV Anti-Virus Toolkit can be use alongside with any antivirus installed on your system. So it can be run as often as users notice that their antivirus software has failed in protecting them, or as an added layer of protection.